In June, we highlighted hand-folded ice cream containers. Because July is National Ice Cream Month, we decided to highlight another ice cream related item. 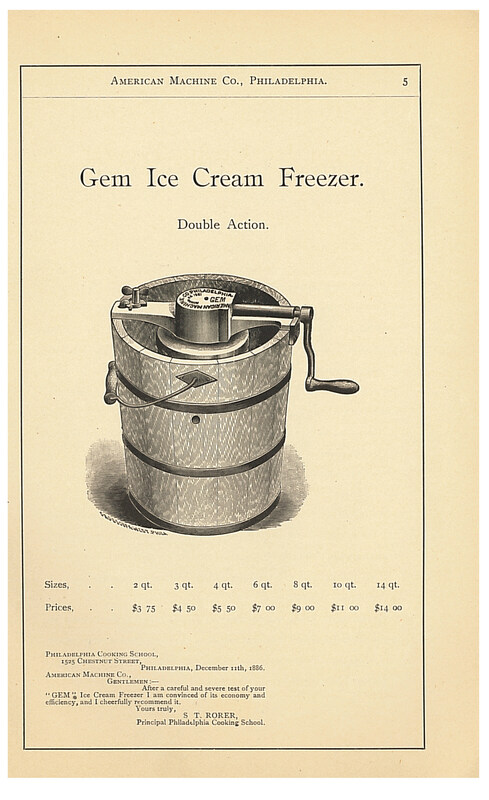 This month we are highlighting an 1889 American Machine Co. trade catalog illustrating ice cream freezers. 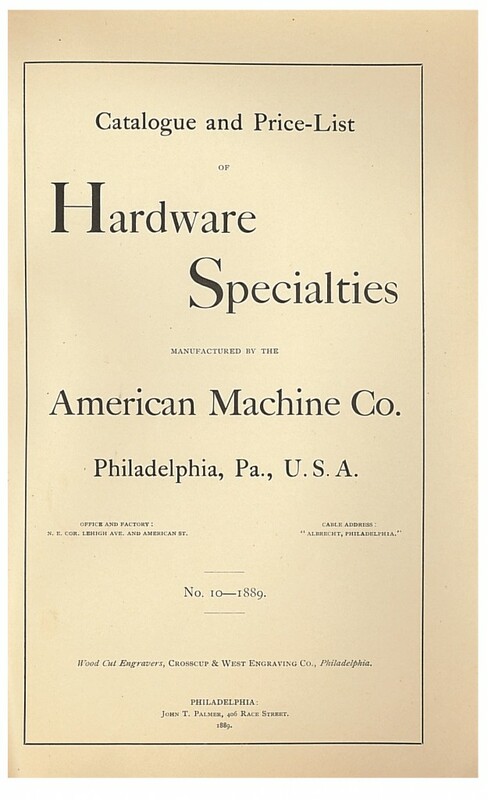 American Machine Co., Philadelphia, PA. Catalogue and Price-List of Hardware Specialties, No. 10, 1889, title page of catalog. One of these freezers, the Gem Ice Cream Freezer, is illustrated below. It was a double-action freezer which meant the can and stirrer moved in opposite directions at the same time or as the catalog describes, “the can is moved in one direction while the stirrer, to which the self-adjusting scraper is attached, is moved in the opposite direction, beating up the mixture within the can.” Another feature of the Gem was that the can could still revolve even when the stirrer was removed. This was useful when preparing frozen fruit. 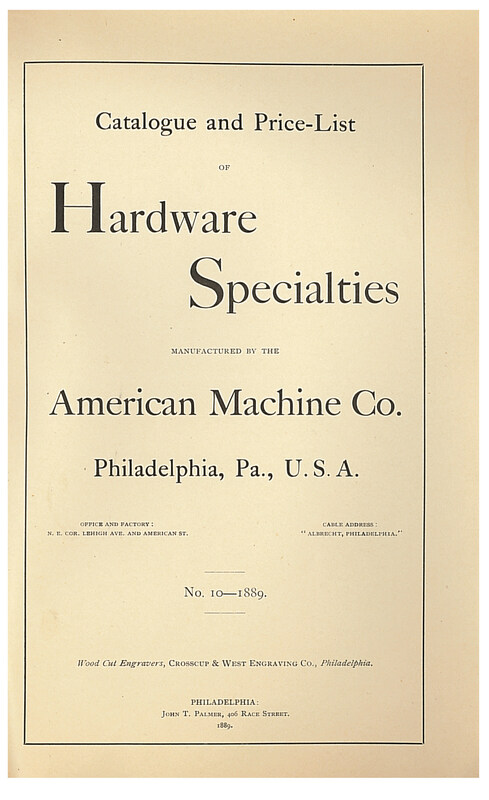 American Machine Co., Philadelphia, PA. Catalogue and Price-List of Hardware Specialties, No. 10, 1889, page 5, Gem Ice Cream Freezer. The gearing of the Gem was completely covered which prevented ice or salt from getting in between the cogs. But more importantly, this acted as a safety feature because it prevented hands and fingers from getting caught in the gearing. The Gem Ice Cream Freezer came in several different sizes from as small as two quarts to as large as 14 quarts. Each freezer was sold with a recipe book written by Mrs. S. T. Rorer, Principal of the Philadelphia Cooking School, and Mr. Jos. Whitten, editor of Table Talk. It included over fifty recipes for ice cream, water ice, frozen fruit, puddings, and other fancy dishes. Catalogue and Price-List of Hardware Specialties, No. 10 by American Machine Co. is located in the Trade Literature Collection at the National Museum of American History Library. Interested in ice cream recipes? Then take a look at two previous posts here and here featuring recipes from 1907. Previous Post Adopt Hand blocked wall papers!